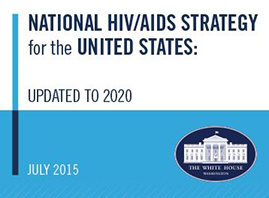 Ten federal agencies are currently working—both individually and collaboratively—to develop a government-wide action plan to implement the National HIV/AIDS Strategy: Updated to 2020, (Strategy) which the White House released on July 30, 2015. In the Executive Order that accompanied the release of the Updated Strategy, President Obama identified those agencies having primary competencies and responsibilities for implementing the Strategy and requested that within 100 days they provide an action plan for doing so. Since early August, a federal interagency working group comprised of representatives from the 10 “lead agencies” and co-led by the White House Office of National AIDS Policy and the HHS Office of HIV/AIDS and Infectious Disease Policy has been meeting regularly to develop this cross-government plan. In addition, the President requested that the Department of State and the Equal Employment Opportunity Commission (EEOC) contribute recommendations to support implementation of the updated Strategy. The Secretary of State will share recommendations for improving the Government-wide response to the domestic HIV/AIDS epidemic, based on lessons learned in implementing the President's Emergency Plan for AIDS Relief (PEPFAR) program. The Chair of the EEOC has been asked to make recommendations for increasing employment opportunities for people living with HIV and provide a plan for addressing employment-related discrimination against people living with HIV. While the Strategy is a policy document providing a roadmap for the nation’s response to HIV/AIDS for the next five years, the Federal Action Plan will serve as the operational plan, describing how the Strategy’s principles and priorities will be implemented. The Federal Action Plan will detail specific action items to be undertaken by particular federal agencies, each with milestones delineated for years one, three, or five. As requested by the President, it will also include steps to strengthen coordination in planning, budgeting for, and evaluating domestic HIV/AIDS programs within and across agencies. Some action items will involve coordinated activity across more than one agency and/or with one or more non-federal partners. As the lead agencies are developing their action items, they are considering stakeholder input shared with ONAP earlier this year during the regional listening sessions, through the online feedback forum, and via other means, including a listening session at this week’s U.S. Conference on AIDS in Washington, DC. The Federal Action Plan is due to be released in early December. The Updated Strategy observes, “This Update is a call to action to myriad systems: everyone is needed to put this Strategy into action and end the HIV epidemic.” So, to ensure that the Nation is working to meet the goals of the Strategy, it also encourages non-Federal stakeholders such as state and local health departments, Tribal governments, community-based organizations, coalitions of persons living with HIV, and others to identify specific actions that they can take—tailored to their own specific missions and priorities—to advance progress toward the Strategy’s goals, perhaps even developing their own individual action plans. What actions aligned with the principles and priorities of the Updated Strategy could your agency or organization undertake?